Today I’m sharing my bed. About 12 years into our marriage we transitioned into a king-size mattress and it was life-changing. LIFE CHANGING! Don’t get me wrong. I love my hubby, but I also love my sleep, and getting just a little more space to stretch out and relax was wonderful. Sadly, my queen headboard didn’t fit the new bed. So my hunt began for the perfect headboard. Big, heavy, wooden bed, that wouldn’t creak and shake like metal frames do. Sleigh bed design. Love that angled back style on the headboard for relaxing in bed. Nothing too ornate on the headboard. When you lean back to watch TV in bed, there’s nothing worse than trying to adjust to the moldings on the bed. Both Restoration Hardware and Pottery Barn had the perfect beds… but at $2000-$5000, I just couldn’t do it. So, I began searching Craig’s List. After about 8 months, (sigh) I found one that fit my needs! So, I asked my friend, R, to go with me to look at it. This bed was pretty banged up! It was in a rough part of town and we had to go back into a yard full of dog poop! So gross!! I think R thought I was nuts! But the bed had good bones, and at $40, I was willing to take a chance. I never got a good before pic. These pics are after adding wood filler, and shims to correct the separating. My hubby also thought I was crazy. He was not impressed when I brought this big ugly thing home. It had so many problems! There were chips in the wood that needed filled, the edges were separating, and it turns out that there were 3 different types of wood and composite wood, so I couldn’t sand it down, or strip the varnish off. It also had been splatted with some kind of chemical, and it smelled so bad! First I filled in the chips with wood filler. Then I used paint stripper to remove the chemical splatters. Then I began painting the footboard while trying to figure out how to fix the separating of the headboard pieces. Since it had composite and real wood, I opted for chalk paint. 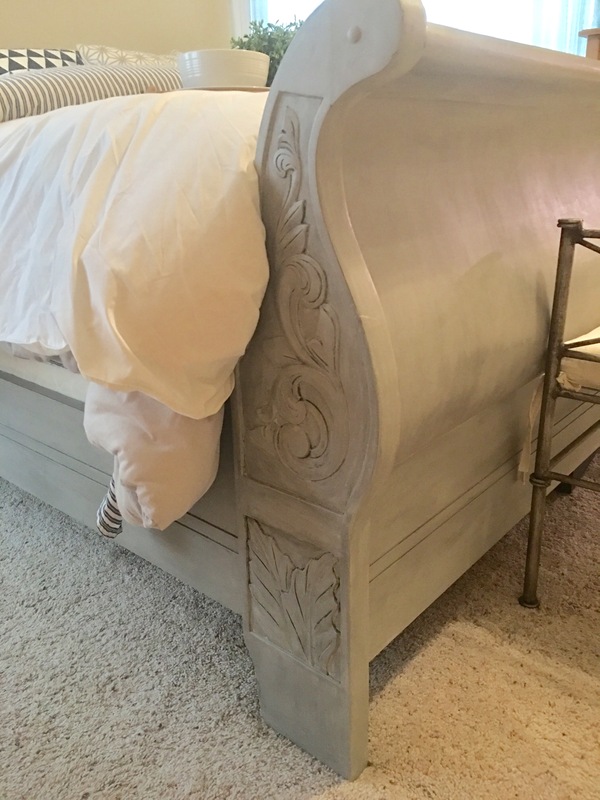 I like how it sticks to all surfaces, so I opted for Annie Sloan’s Paris Grey Paint. I was so upset! And my husband was done! He was ready to put the whole bed on the curb for the trash man! I was in over my head, and I knew it! So I asked for help, and my sweet neighbor who builds furniture came to my rescue! The poor man is partially paralyzed, but still can function and builds beautiful furniture pieces! We took the ends off of the headboard and footboard, glued them back together and used shims and screws for solid support. Then we synched all the pieces together with rope clamps. I learned so much from his help! You can barely see the scar! After painting, I took sandpaper and distressed the edges. Then I mixed ASCP Graphite paint into the Annie Sloan Clear Wax, and rubbed it over the paint. The graphite gave the Paris Grey a darker look. When we put the bed together it looked amazing. My hubby was so impressed and happy with me again. Phew! Total cost of the bed was $140. 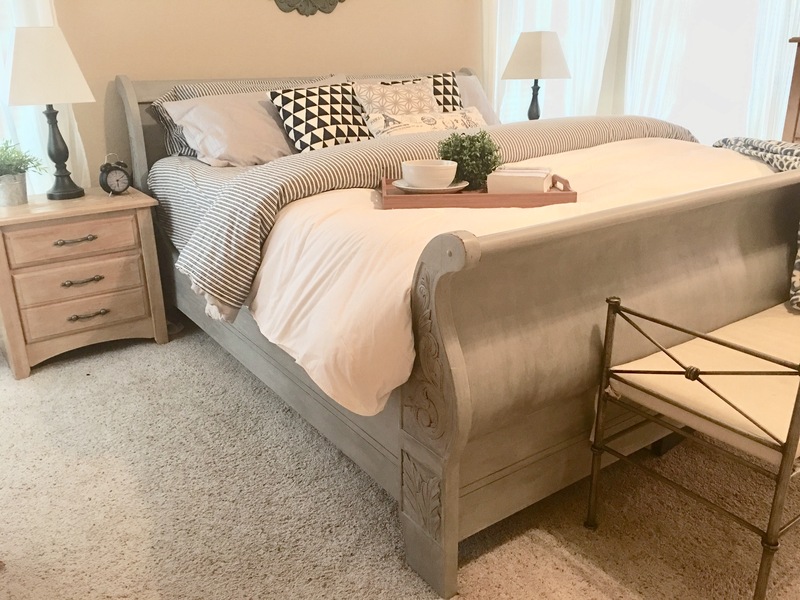 $40 for the bed, $60 in paint, and $40 for the gift card to the neighbor who came to my rescue! I love it! The carvings on the edges make me happy, and it doesn’t squeak when we move around in it! It’s perfect! So beautiful!! Did the paint stripper take out the smell as well? Yes it did! Thank goodness!! Haha!